Word of mouth and recommendation is often the best way to be sure that you are making the right decision. Below you will find some testimonials made by Myal and Peg's clients. It was an absolute pleasure to work with Myal and friends not only during our event but also leading up to it. I've never worked with such helpful and co-operative contributors, the event certainly benefited from their invaluable input and knowledge. The team attracted over sixteen thousand visitors over the weekend and compelled several visitors and staff alike to leave glowing comments about their performance. I am very much looking forward to working with them all on future events. I would like to thank you both very much for visiting and for entertaining the people of Winchester. I was impressed by your music and your costumes, and the pleasant way you interacted with visitors. David Spencer, Chatsworth House Trust. Had a fantastic day today, could you please forward me the names of the groups involved and the wonderful musicians who taught my children to dance. If you ever need a rave review let me know. Thanks again. Yours M. Baxter. I'd recommend you to any teacher. Due to the success of the residential we were able to persuade Myal and Peg to travel up North to help us with a Tudor Day transition project. Year 5 pupils arrived at our school where they were met by Henry VIII and one of his wives and were piped into the building by Myal and Peg. As well as teaching the pupils some of the Tudor dances they also led some felting sessions. The day was a huge success and there was a real buzz around the building. 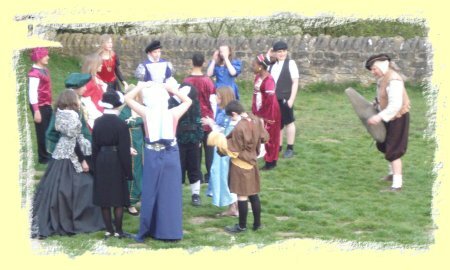 At break Myal and Peg were surrounded by older pupils asking them about their costumes and what they were doing. It was a real example of History coming alive. As a teacher I found Myal and Peg extremely easy to work with as well as fun!! They had a massive input into the planning of the day and I was able to draw on their vast experience for putting together resources. I look forward to working with them again! Having Myal play at both our wedding service and our reception was a real injection of fun into our special day. The pipes sounding out in the church made for something of a change to the organ and everyone enjoyed the different approach, even adapting a few of the traditional tunes! 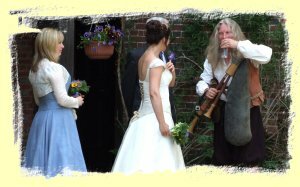 At the reception the lively music got things going and we would recommend anyone looking for an exciting alternative to use Myal for any occasion. Myal always pitches his activities/workshops to ideally suit his audience, on this occasion, adults with learning disabilities. He creates a relaxed, friendly atmosphere in which to learn and provides a wide variety of activities to suit the learning styles of the Museum Clubs members. 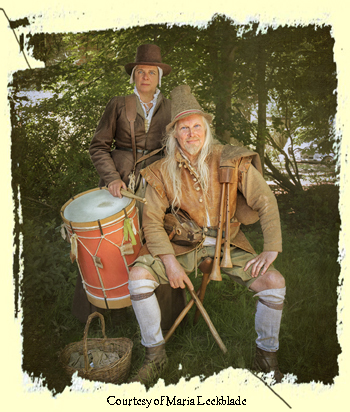 They have made musical instruments, acted in plays, learned songs and taken part in object handling sessions over the course of several workshops. I would wholeheartedly recommend Myal, not only are his sessions inspirational and fun learning experiences but he is also extremely reliable and professional. 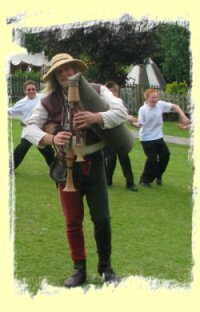 Myal spent two and a half days at our school working with all the children from Year 2 through to Year 6.The kids had a great time learning a variety of Tudor dances and songs. It was fantastic to see so many children enjoying a new experience. Myal even got my son to dance, and that never happens! 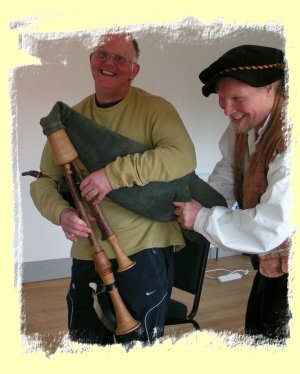 Myal played a huge part in the success of our Tudor Pageant week, his contributions to the children's learning over the two days of workshops were invaluable and on the morning of the pageant his pipes gave us the atmosphere we were trying to evoke, it was the kind of event that the children and parents will talk about for many years. I look forward to having Myal come back to our school in the future.